Sig Sauer introduced the Sig P365 Micro-Compact 9mm pistol at the 2018 SHOT show to quite a bit of fanfare and anticipation. The P365 was really designed to target the CCW market as a “higher” capacity CCW handgun that could be carried every day of the year (hence the 365 name with there being 365 days in a year. The most obvious question was what’s the big deal with another micro-compact 9mm? Well, for starters, the capacity is kind of a big deal. Most micro-compact or even compact 9mm pistols designed for CCW are built in a single stack magazine design. Typically these designs feature a single stack design that will carry anywhere from 6-8 rounds, depending on the model. In order to get more rounds into a single magazine, one typically has to use an extended magazine. While the extended magazine is certainly a viable option, it also adds length to the grip of the handgun. So, up until the P365, the only other way to increase the capacity of the micro-compact 9mm was accomplished by switching the design from a single stack over to a staggered double stack design. Moving to a double stack magazine design certainly increases the magazine capacity, but it also drastically increases the size of the grip, and impacts the overall size of the handgun. Here’s where the P365 is different. It was built around a proprietary Sig patent-pending double stack/single stack magazine. As a matter of fact, Sig Sauer has reported that the Sig engineers built the magazine first, and then built the new P365 around the magazine. The magazine is a double stack design that tapers into a single stack towards the top (which some in the firearms industry are calling a “semi double stack” or a “modified double/single stack”. This equals a 10+1 capacity for the standard P365 magazine, and a 12+1 round count for the P365 extended factory magazine. This new magazine design keeps the overall grip of the P365 every bit as slim and trims as most comparable singe stack 9mm CW pistols on the market. To help put that in perspective, let’s compare the dimensions of the P365 with a standard magazine against a Glock 43 with a standard magazine. In that comparison, the P365 is .48” shorter than the G43, and the P365 grip is .05” narrower. Granted the loaded G43 weights 4 ounces less, but the P365 is carrying 10+1 rounds while the G43 (with a standard magazine) is carrying 6+1. So the P365 is only slightly heavier than a Glock 43 when loaded, but carries nearly 50% more rounds. 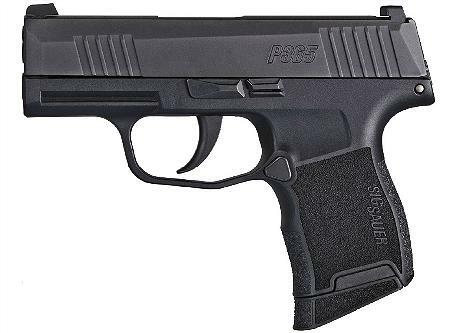 The P365 is a striker fired model that has a number of design similarities to the popular Sig P320 series. Like the P320, the P365 uses a removable and serialized fire control unit in frame chassis. The trigger pull seems to be in the 5 lb range and reminds me of the trigger pull on a factory P320. And also, like the standard P320 series, the P365 doesn’t have fancy operational controls. From a size standpoint, the P365 reminds me of a cross between a Kahr PM9 and a S&W M&P Shield, with the grip size being somewhere in between. If you have Paul Bunyon like hand, then your pinky is most likely going to hand off the grip with the standard magazine. However, you should be able to get a better grip with the 12 round extended magazine with a pinky rest. Ditching the SIGLITE sights on the P365’s and replacing them with the newer X-RAY 3 day/night sights. The so called “2nd generation” Sig P365 models are now shipping and current reports seem to indicate that the issues have been resolved. #1 – Do you offer any holsters and magazine carriers to fit the new Sig P365? Yes, any of the holster models or magazine carrier listed below are made in a version to fit the Sig P365. #2 – Will the Sig P365 fit in a holster made for the Sig P320 SubCompact since they are close to the same size? Unfortunately, it won’t. Although the two Sig guns are close in size, the P365 is a completely different frame so it won’t fit well in a holster made for a P320 SubCompact. #3 – The P365 looks to be the almost the same size as the S&W M&P Shield. Will it fit in a holster for the S&W M&P Shield? We actually tried test fitting a P365 in an M&P shield holster, but the 365 didn’t fit well at all. #4 – Sig Sauer has indicated that the P365 is a replacement for the P290RS. Will the P365 fit in a holster made for the P290RS? Sorry but it won’t. The dimensions between the P290RS (which has now been discontinued by Sig) is actually pretty different than the P365. And, likewise, a Sig P290RS will not fit in a holster made specifically for the Sig P365. #5 - Do offer a Sig P365 pocket holster? #6 - Can you recommend a Sig P365 appendix carry holster? #7 - Do you carry a Sig P365 ankle holster? #8 - Why isn’t there a Sig P365 pistol pictured in any of the holster models shown on below? Good question and here's the answer: The weapons shown in the holsters below are for demonstration purposes only. The holster models listed on this page are made specifically to fit the Sig P365 even though other handgun models are displayed in the holster models below. We try to photograph as many gun/holster combinations as possible, however we do not own every single handgun model on the market. As a result, we are not able to show every possible combination. Any holster or magazine carrier listed below is available in a version to fit the Sig P365.